The high quality of its products combined with the creative mind of its creator never cease to amaze me. 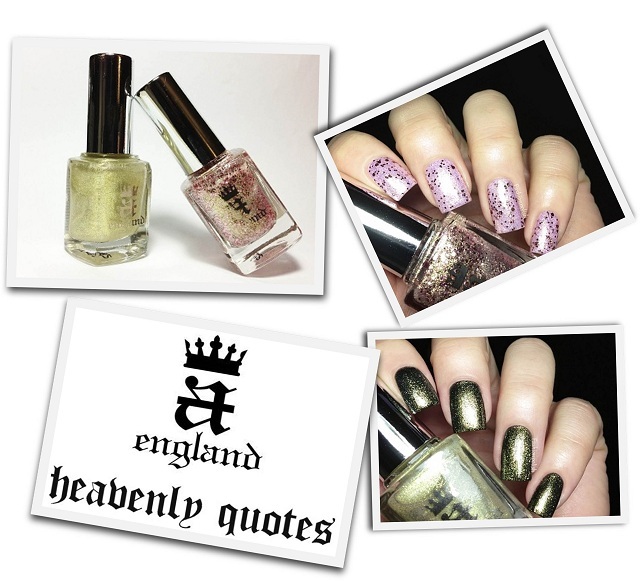 Today I have for you the latest additions to the a-england line, She Walks in Beauty & And the Moonbeams..., both part of the Heavenly Quotes series. And they are nothing like their predecessors! 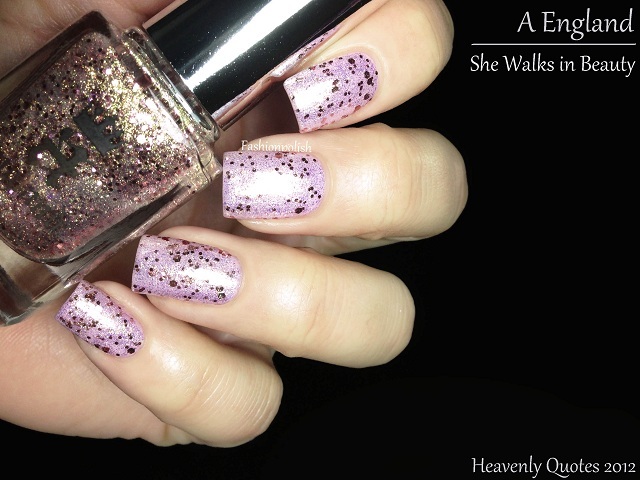 She Walks in Beauty is a heavy mix of gold and green shimmer combined with various sizes of hexagonal pink glitters. While it would reach full opacity in 3 coats, I decided to layer it over a-england Iseult, the perfect, streak-free, baby pink shimmer. The combination of the two shades result in a delicate yet rich and sophisticated look, stunning! 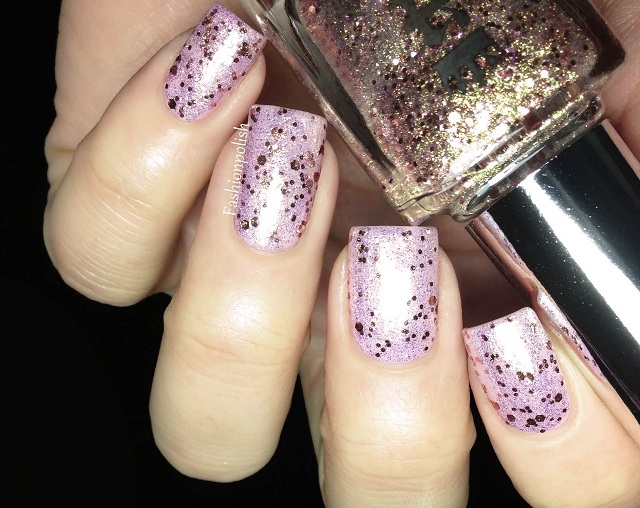 Formula was a pure wonder, easy to apply and with a great glitter dispersion. This is one coat of She Walks in Beauty over two coats of Iseult paired with the Knight (basecoat) / The Shield (topcoat). 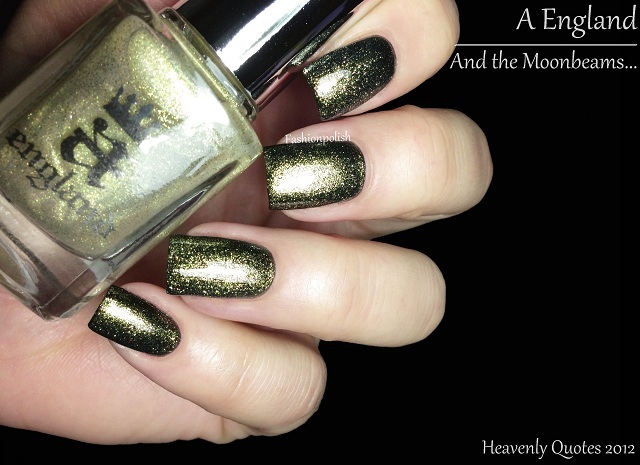 And the Moonbeams... is a sheer but gloriously dense gold and green shimmer in a clear base. The shimmer is the exact same as the one in She Walks in Beauty and while they would probably look perfect with one another, I was most inclined to pair it with Beauty Never Fails, also part of the Heavenly Quotes series, in an attempt to emphasize its dramatic look. You're looking at one coat of And the Moonbeams... over two coats of Beauty Never Fails, combined with the Knight (basecoat) / The Shield (topcoat). I must confess that for the first time with a-england, I wasn't immediately sold on these shades when I first saw them but I am so glad I was able to see them for myself! The flawless formula and rich blends make them PERFECT for layering and I couldn't be happier with the matches I made for them! She Walks in Beauty & And the Moonbeams... retail for £9 each and are available for sale through email order and very soon on a-england.co.uk. And... for a touch of Litterature, I strongly encourage you to visit Eugenia's blog ommorphiabeautybar.com to learn more of the story behind the shades! Your swatches are perfect as usual. These are gorgeous!!! I adore your layering combos! What a great idea over pink! Stunning swatches and HAPPY BIRTHDAY!!!! Both of these are really gorgeous. I especially like Moonbeams. The "She Walks in Beauty" is really beautiful. I know exactly what you mean when you weren't inmediately sold on these two, but you really proved (again!) Aengland does live up to my high expectations. Perfect combinations for layerings, Sam, great choice!!! And a very happy Birthday!!! you make crazyyyy ! It's soooo beautiful ! I love the first one! So cute! OMG!!! These nail colors are so amazing. I wish I have them. I better include them in my wishlist now. These are both lovely polishes!! I love Iseult and Beauty never fails... thanks for this idea! This weekendI will try it :-D!